These files are then emailed to us for processing, after which the wire(s) is marked, sorted and bagged for shipping across North America. We can also facilitate any termination requests, or complete harness buildup(s) and fabrication. Aeronav acquired a state of the art laser wire marker form Tri-Star Technologies as a hub for its business. The first of its kind in Canada, the M-100L is capable of high volume demands brought on by the aerospace industry. We chose the M-100L due to its reliable track record and international use. From as far as Israel, Taiwan and South Africa, this machine has made a global impact in laser marking requirements, and is now certified to meet Boeing specification BAC 5152. 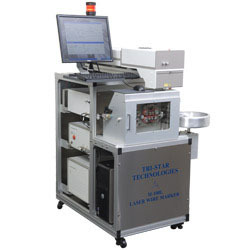 The M-100L is a fully automatic, computer controlled, high speed, solid-state UV laser wire and cable marking system. It is PC controlled and runs Windows based software. All wire/cabling data can be entered into Microsoft Excel with each wire field(s) specifically set to the user’s preference. The benefit of this feature is that clients or other shops requiring high volume wire marking can produce the file(s), and email them to us for processing. Dependent on the amount of text, spacing and character gap, the M-100L is capable of a processing speed up to 100 feet per minute. It utilizes a 355nm UV laser system, which is compatible with most insulation materials. The laser’s output is manually adjustable, so that contrast can be adjusted for the various wire types used in industry. Since the laser marks the surface of the wire, there is no physical insulation damage or degradation of the wires integrity. The M-100L supports all 24awg to 4awg wire, both round and twisted. It also meets MIL-W-5088L, MIL-M-81531 and complies with BAC 5152.